Dr. Christopher Hove is double board certified in ear, nose, and throat medicine as well as facial plastic surgery for knowledge and experience of form and function. We offer the latest advances in diagnostics and hearing aids from a licensed audiologist. Hearing loss can negatively affect your psychological and physical well-being and cause feelings of insecurity, frustration, anger, confusion, and isolation. Main Line Ear, Nose & Throat in Paoli, Pennsylvania offers comprehensive audiology and hearing aid services from a licensed audiologist, Dr. Michael McCandless. For the diagnosis of hearing loss or tinnitus, as well as balance disorders and vertigo, Dr. McCandless can help. Our audiologist also provides expert witness testimony and case reviewing. Main Line ENT offers a large selection of the most advanced hearing aids, available in Paoli, PA, along with FREE hearing aid trials so you can test and fit the device that’s right for you. There are a number of styles of hearing aids, such as behind the ear, in the ear, and in the canal. With the addition of new computer processors and “open style fittings,” today’s hearing instruments can achieve very high satisfaction rates among patients. Dr. McCandless will help find the perfect style for you based upon your hearing needs and your lifestyle. 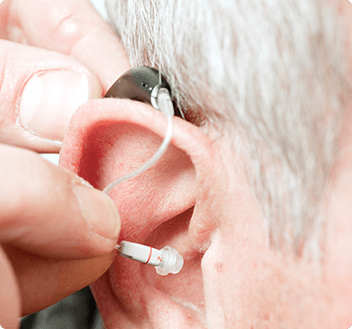 Hearing aids provide a comfortable fit and excellent sound quality. They now are able to help most people follow conversation in the presence of background noise. There are also many wireless options available via Bluetooth technology. For the comprehensive care of tinnitus and hearing loss, including a huge selection of the latest hearing aids in the Philadelphia metro, call Main Line ENT of Paoli, PA at (610) 647-1585. You can also request an appointment online. Copyright © Main Line Ear, Nose & Throat. All Rights Reserved. Paoli ENT doctor and facial plastic surgeon treats patients with nasal and sinus problems, chronic sinusitis, allergies, broken nose, deviated septum, nasal blockages, polyps. We provide specialized treatment for hearing problems, hearing loss, vertigo, dizziness, ringing inthe ears (tinnitus), chronic earaches and infection, damaged or perforated eardrum, and Meniere’s disease. Throat conditions such as head and neck cancer, nodules, hoarseness, tonsillitis, snoring and sleep apnea require expert care from a board-certified otolaryngologist. Dr. Hove also offers balloon sinuplasty, neck lift, facelift, cosmetic laser treatments, eyebrow lift, ear pinning, nose reshaping, Botox, and more. We also offer a large selection of hearing aids.